John helps horses with problems such as aggressive behaviour, biting, kicking, bargy horses, napping, shoeing, clipping, first halter training, foal handling, starting youngsters, riding away, loading and traffic phobias, remedial horses, sanctuary horses & ponies, nervous/untouched and traumatised horses. Also bucking and rearing horses (although with all cases pain has to be eliminated before any training can start). All horses partake in a lot of groundwork as problems can start from the ground. Horses can be ridden Western or English. John is an inspirational teacher and helps people and horses to improve their confidence and skills. There have been many success stories due to John as sometimes he can be both horse and owners last place of call. For help with your horse John can visit you at your home or your horse can come to the training yard at Old Shawls Farm. John feels it is important the owner is involved in each. 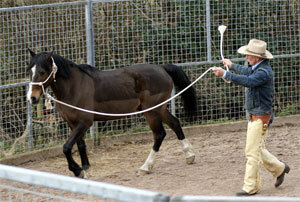 Step of the training so the horse gets consistent handling and riding from both trainer and owner.